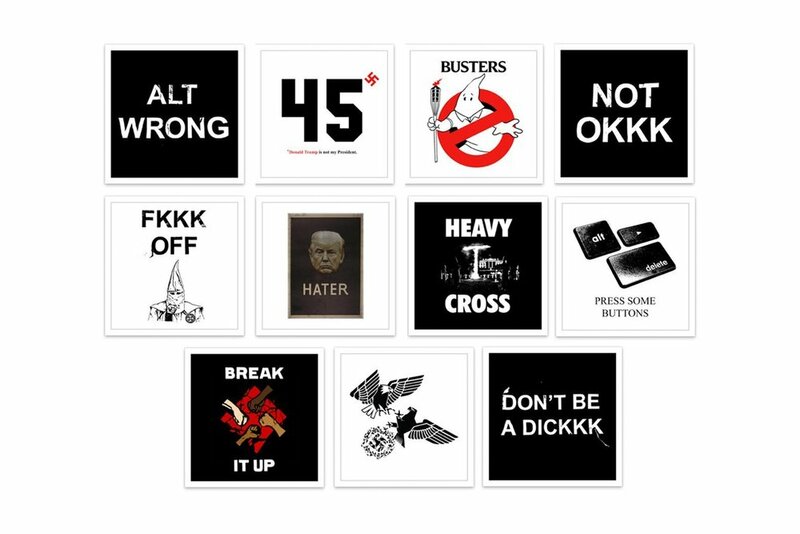 Bobby Hundreds, co-founder of The Hundreds, used his creativity and talents to give us 11 pieces of anti-hate and anti-Trump artwork for everyone to freely put on t-shirts, stickers, posters, protest signs and anything else we want. "The art is now yours to use, unify, and FIGHT BACK," he said on his recent Instagram @bobbyhundreds post. Bobby has always used his platform to step out and speak up for what he’s believed in, whether it'd be on a t-shirt for The Hundreds, or as an written editorial piece. In light of the events in Charlottesville, the openness of white nationalists, white supremacy, the alt-right movement, and Trump's lack of a stand against these groups and events, Bobby Hundreds is once again using his platform to stand against for what he believes in and urges others to do the same. "Hey fellow streetwear brands. If today pisses you off, take that anger and energy and put it into your designs and messaging. Speak out," he tweeted @bobbyhundreds last Saturday (August 12), referring to the white nationalist rally in Charlottesville. Download Bobby Hundred's free anti-hate/trump art here.